I was just getting started on a series of photographs of mountain flowers (essentially crocuses) but decided to have a short interruption in order to show a major change to the Chania harbour 'skyline'. Last Sunday the 'Harbour Pavilion' (Λιμενικού Περιπτέρου), the derelict building adjacent to the mosque, was pulled down, leaving a vast open space right on the sea front. You won't find many images of this building on this web site because I was consistently trying to avoid having it in the picture (but you can still see two photos here and here). So needless to say I am glad that it is gone and so are most locals. 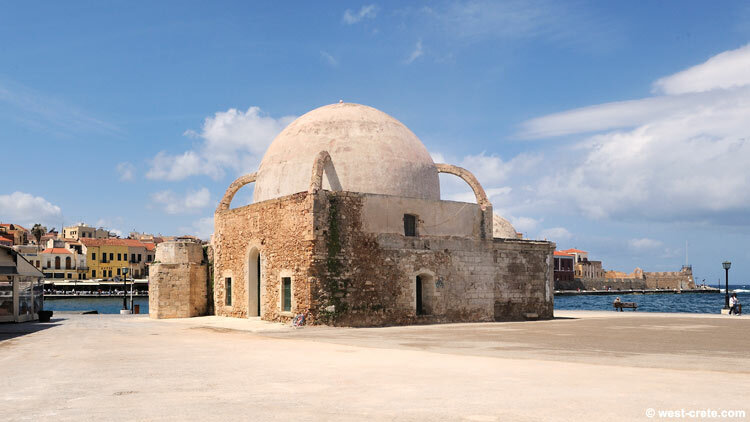 But the action has also drawn some criticism, fro example from the Chania Architects Association which complained that there was too little consultation and that the 'Harbour Pavilion' was itself a building worth preserving. 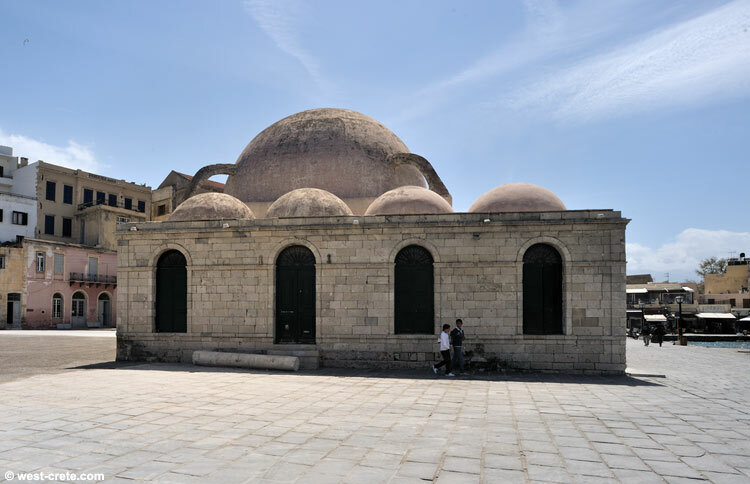 It had been designed and built by a famous architect, Patroclus Karantinos, in the mid 1960s and was of a style complementing the mosque without duplicating any of its features. Well maybe it was not a bad piece of design but it was also allowed to become more and more dilapidated and I found it to be an eyesore from the moment I saw it (in the mid 70s). Now it's gone! 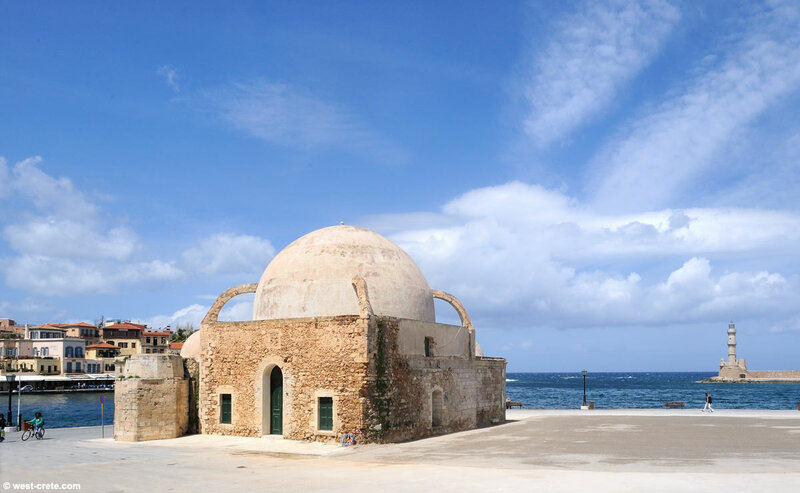 I think that it is not yet quite clear what will happen in this large space (see the top photo to see how much space there is) instead but the current local powers have clearly stated that it would not be used for more tables and café terraces. Let's see. And I'd be interested to see what YOU think about it. Go to the Facebook page of this site and have your say. PS - If you look again at the top three pictures you can see that the ground has been covered with a fresh layer of cement. 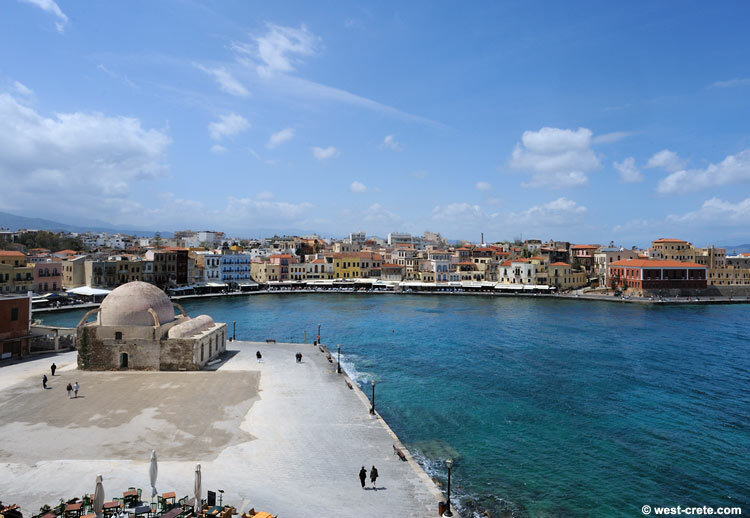 This is only temporary: the city of Chania is expecting two large cruise ships this weekend with over 5000 visitors and the town wanted to be presentable for them and not leave a building site in one of the best parts of the harbour. . Well done!